Institute of Banking Personnel Selection (IBPS) had announced the Dates for the 2nd CWE for Probationary Officers / Management Trainees. 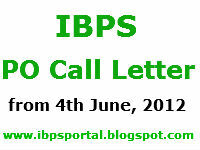 The Recruitment Notification for IBPS PO exam 2012 was published in March 2012 and the exam date is tentatively fixed at 17th June, 2012. Registration Details: To download the Call letter, registration details Like Registration Number and Password are required. .These Registration details were generated at the time of the submitting the Online Application. 2) After opening the Website, click on the appropriate link for Downloading the Call letter.After that enter your registration details and Click on the Submit Button.Soon after you click on the Submit button, the Call letter will be generated. The students must reach the examination hall at the time and venue given in the Call letter.It is important that students must reach the examination hall well in time in order to avoid the last minute trouble. In the examination hall, the examiner in charge will verify the Identity of the Candidate by checking his/her Call letter and Identity Proof.The Candidates identity is verified by matching his/her details in the Call letter and Attendance sheet.